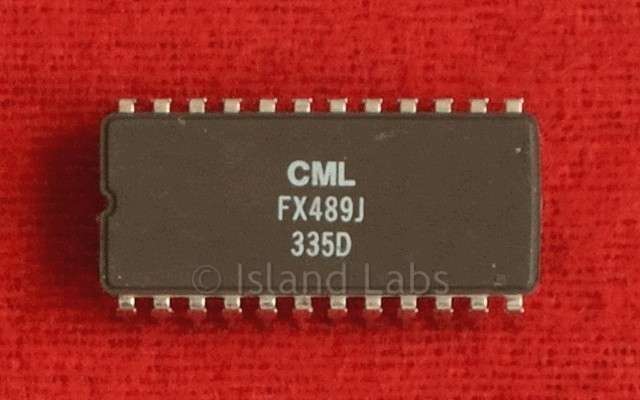 The FX489 is a single-chip modem employing Gaussian Minimum Shift Keying (GMSK) modulation. Having a pin-selectable BT of 0.3 or 0.5, the FX489 may be operated at data rates between 4000 bits/s and 19200 bits/s. For use in FM radio data links and data communication systems conforming to DOC and FCC spectrum limitations for 12.5kHz and 8,000 baud at a BT of 0.3, and 12.5, 25.0, and 50kHz channel spacing and data rates of 4800, 9600 and 19200 baud respectively at a BT of 0.5. The Rx and Tx digital data interfaces are bit-serial and synchronised to Rx and Tx data clocks generated by the modem. Separate Rx and Tx Powersave/Enable inputs allow for full- or half-duplex operation. Rx input levels can be set by a suitable a.c. and d.c. level adjusting circuit built, with external components, around an on-chip Rx input amplifier. Acquisition, lock and hold of Rx data signals are made easier and faster by the use of Rx Control Inputs to clamp, detect and/or hold input data levels and can be set by the µProcessor as required. The indication of the quality of the received signal is available from the Rx S/N output. The FX489, a low-power CMOS microcircuit, is available in both 24-pin plastic Small Outline (S.O.I.C) and DIL packages.